Google Recruitment 2018 Apply Online for Latest Jobs from Google India in the all branches in India like Ahmedabad, Gurgaon, Delhi. Gujarat High Court Syllabus 2018 will come with Preliminary exam, who passed it they will be transferred to Main Exam than Interview. GHC District Judge Question Paper, Exam Pattern and other details given below. 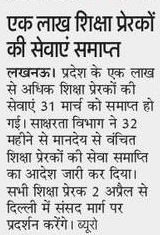 UP Prerak News 2018 This is good news of 8 March is UP Government has extended the Employment date 2600 Shiksha Prerak in UP who teaches. For More Details like UP Prerak Salary, Selection Process and Educational Qualification you may check below.